It did not seem a terribly long time since I had last visited St Peter, and so it came as some surprise to discover that it was almost six years since I had last set foot in this remote spot. That was back in the days when I went everywhere by bike, and perhaps ninety per cent of the first visits to the churches of Suffolk that I made was by hauling my cycle onto what was then Anglia Railways, and then plotting a course between Diss and Stowmarket, for example, or Thetford and Bury. These days, the local rail service for cyclists is brilliant; One Railways, as it is now, lets you take a bike anywhere in East Anglia for free, and people do. But back then, I was a rare beast. 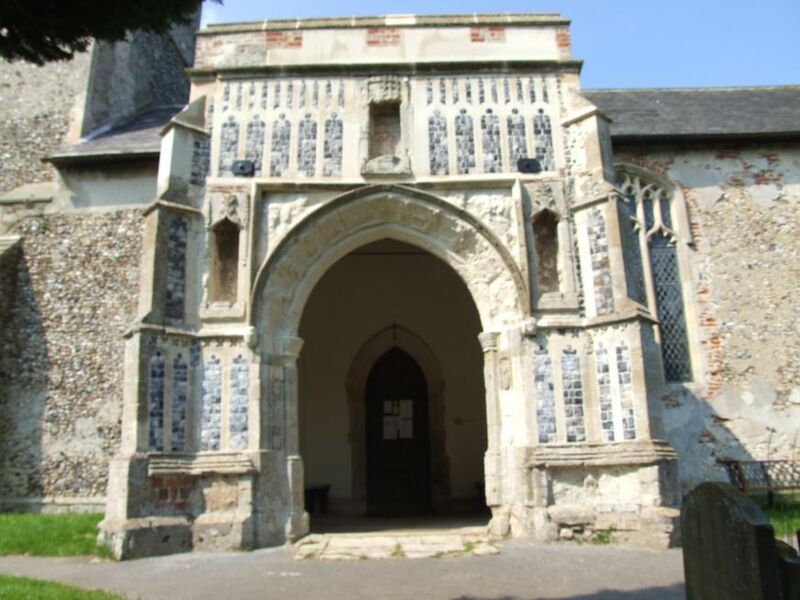 Although I have parked my bike in most of Suffolk's church porches, Monk Soham is not one of them. 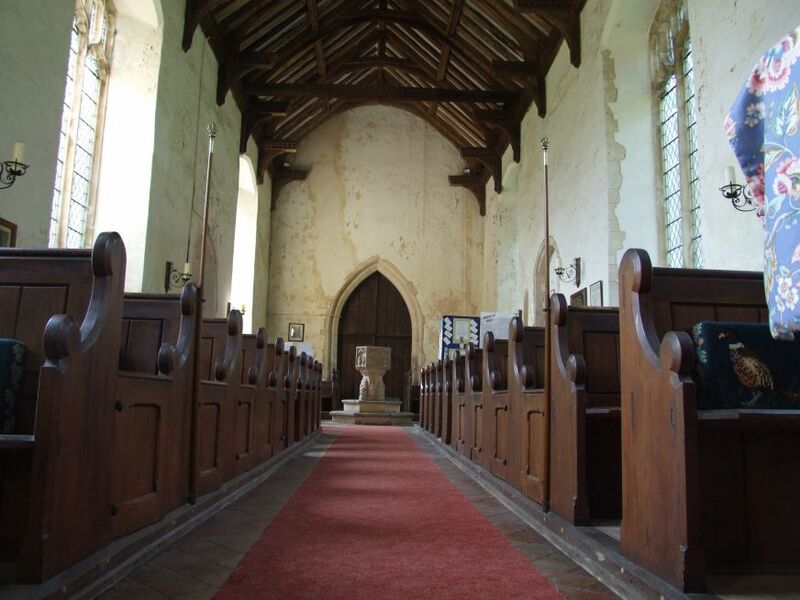 On that first occasion, I had come here in deepest winter, and felt bound to confess on the first entry for this church that I had not cycled to it. If I had have done, I might have risked the half mile trek across the ploughed field from the road. 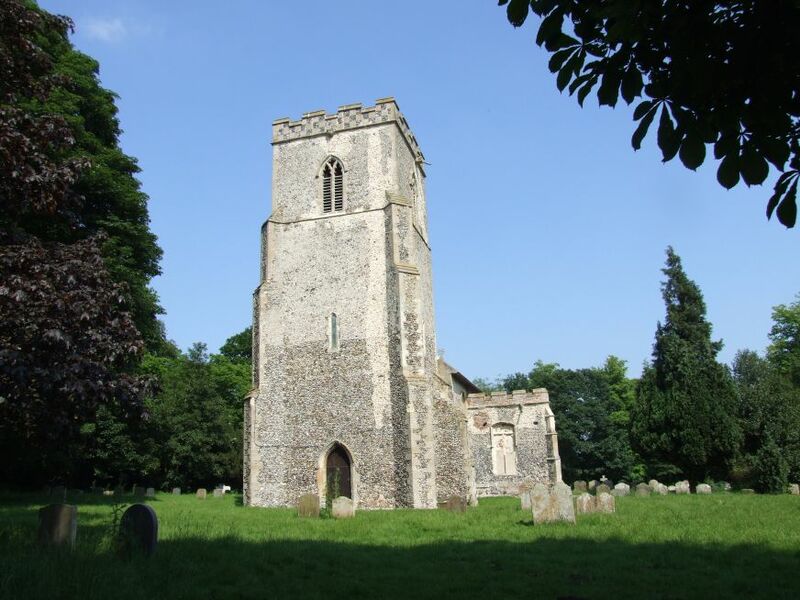 The sign to the church appears as you reach the top of the rise, on this narrowest, remotest of High Suffolk roads. I would certainly have stopped to take a photograph from here; the south side of the church looks magnificent, starkly so in winter, riding the furrows in full Decorated glory.But my chauffeuse sped on, nervously eyeing the road ahead for oncoming vehicles. We described a wide, clockwise circle, the church off to our right. Now we were to the west of it, the tower incongruous as the wings of the nave folded behind. On we went, and now it was the north side we were seeing, long, tall and moody. My chauffeuse broke the silence. "We're not getting any closer to it, are we", she said. And nor we were. But just as we caught our first glimpse of the east window, and I thought we might even end up back where we started, I saw a farmyard ahead. "Go in there!" I shouted. She hesitated a microsecond - she'd always been wary of my cycle-centred church navigation sysyem ever since I absent-mindedly directed her on to a river towpath in north Norfolk - and then we swung sharply on to the narrow concrete track. The car ballooned slightly, as we hit a section that had subsided, and headed on to what turned out to be the Hall farm. My driver sighed meaningfully, as we entered a labyrinth of units and disused farm buildings, coming out in a yard. A man off in the distance was stacking sacks in the bitter northerly wind, which howled through the gaps. I looked around, expecting to see duelling banjos. But he was very friendly, and directed us through the farm buildings to a hard-standing area. And there was the church, just across a field. Leaving my long-suffering companion to Dostoevsky's The Idiot, I set off. I cannot hope to convey to you how cold it was, for although the snow of the last few days had dissipated, a sharpness carved its way beneath the skin. I headed for the shelter of the south side. As I passed the east window, I looked up. It is awesome - it must be one of Suffolk's widest. It has beautiful, Decorated tracery, revealing more of the age of the church than the Perpendicular makeover of the nave windows. 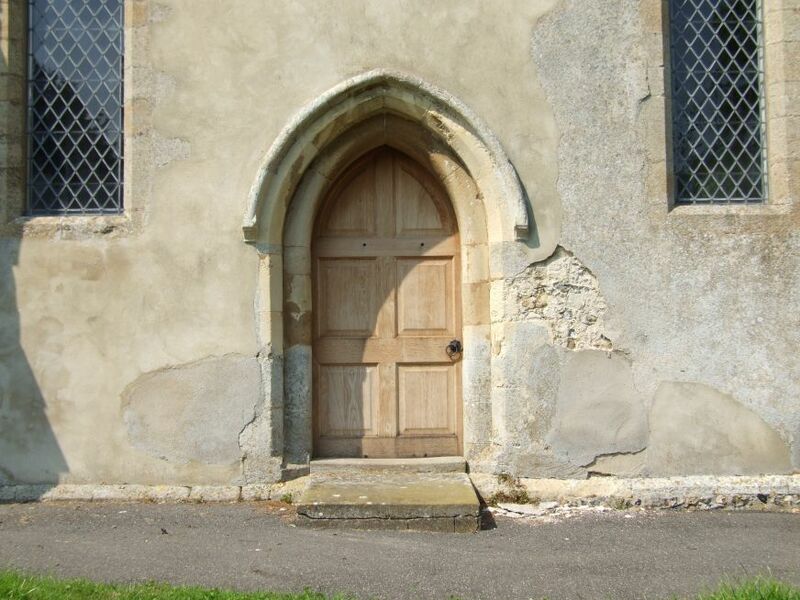 Nowadays, I would expect a church like Monk Soham to be open, but six years ago more were kept locked. However, I entered the 15th century porch full of hope. 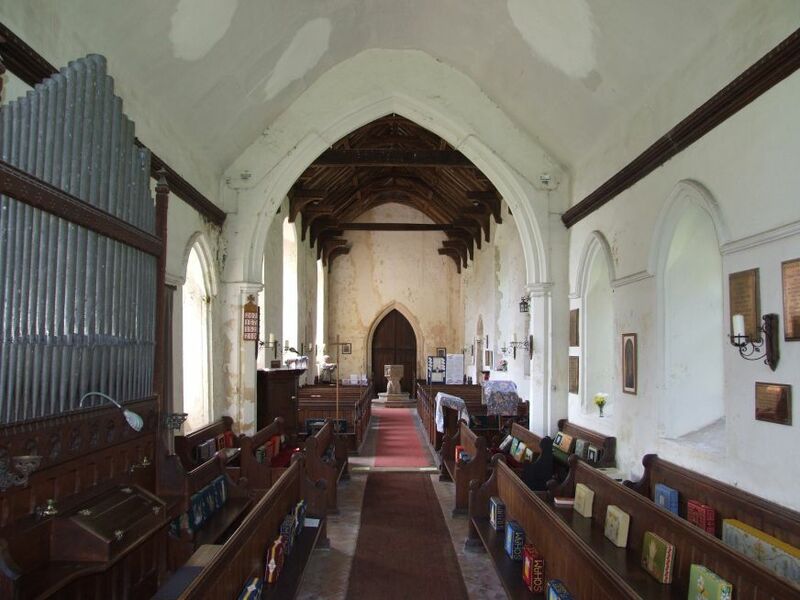 The porch is a vast, shabby affair; I'd not go as far as to call it derelict, but the irony is that when you get a porch of this date built against a church a couple of hundred years older, the Perpendicular usually looks so much neater than the Decorated. Not here, though. And the door was open. I stepped down into a bright, cold, ancient interior, full of charm and interest. 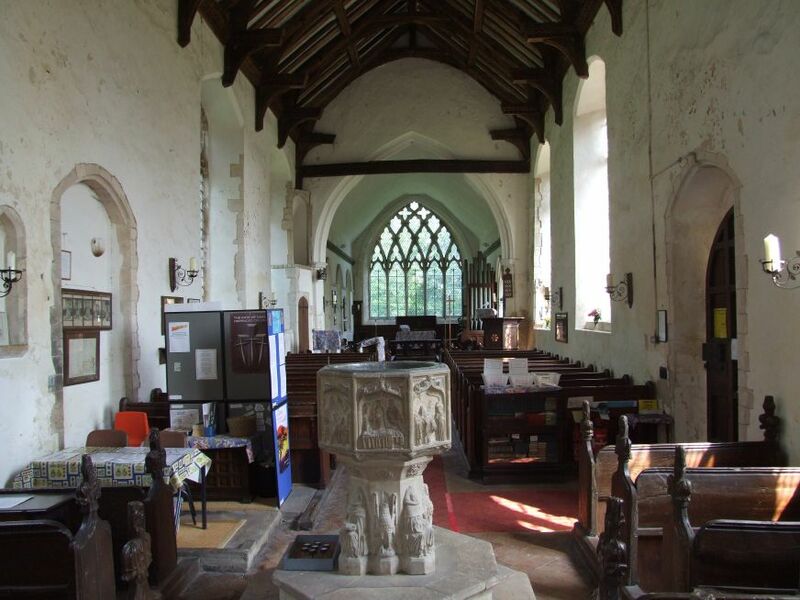 Immediately facing me was the Seven Sacrament font, one of thirteen in Suffolk, and one of less than forty in all England. It is broadly similar to that at Westhall, albeit without surviving original colour. The panel facing east is for the Mass, and then, anti-clockwise, they are Baptism (NE), Ordination (N), Confirmation (NW), Last Rites (W), Matrimony (SW), Crucifixion (S) and Confession (SE). 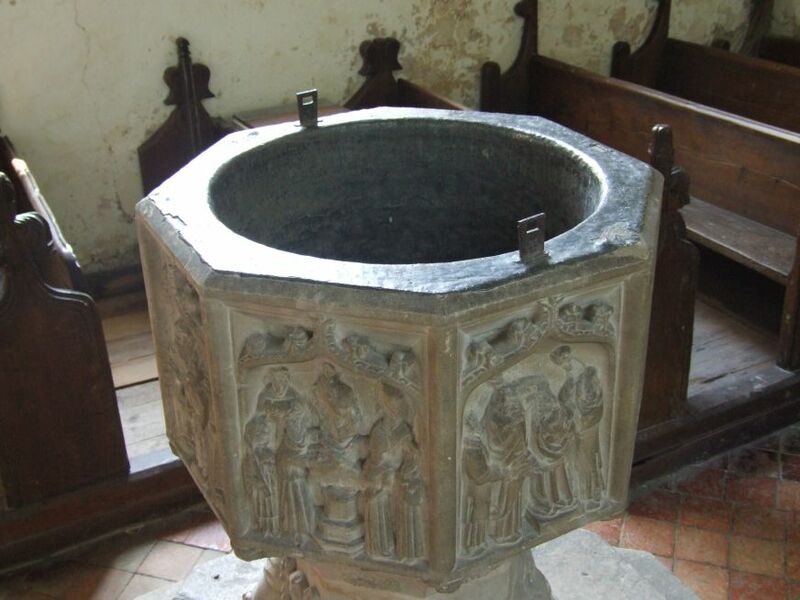 It is mutilated, to be sure, rather more badly than nearby Laxfield and Badingham, but one of the intriguing aspects of the font is that some details reflect the nature of the parish in the late 15th century, when it was made. 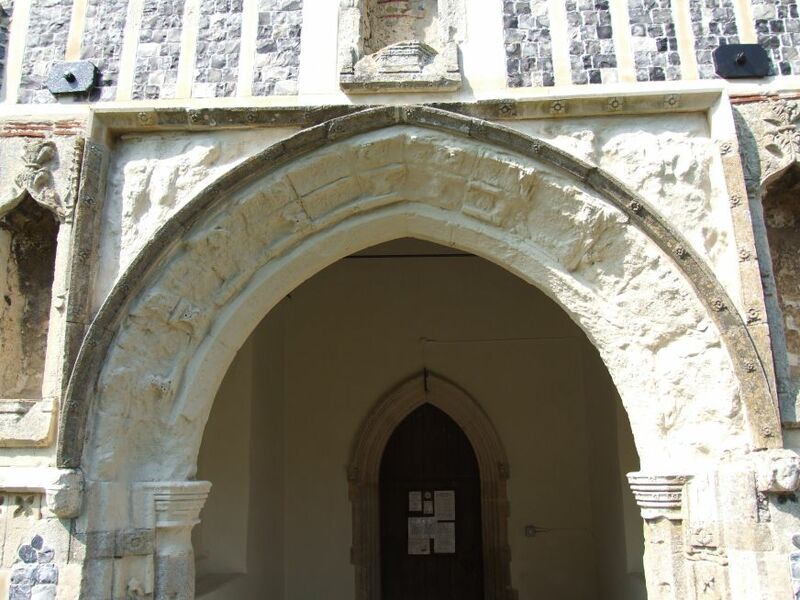 For this parish was a retreat centre for the monks of Bury Abbey (hence 'Monk' Soham). Around the stem, the four evangelists are all wearing monk's cowls. My favourite panel is the one for baptism, which includes a font like this one, and an acolyte holding a lighted taper. The foreground figures are smaller than those behind, an attempt at perspective perhaps, and several are wearing monk's cowls. Breathtaking. Breathtaking too was the sheer crassness, on the occasion of my first visit, of someone having used insulation tape to stick an electric lead to it for the Christmas tree on top. I was sure that if you'd put pagans, atheists or (dare one suggest) Muslims in charge of it, they would not have done anything so profoundly offensive. No doubt nowadays, it wouldn't happen, though for Health and Safety reasons rather than as a matter of respect. Coming back in 2007, I found one great loss since my first visit. 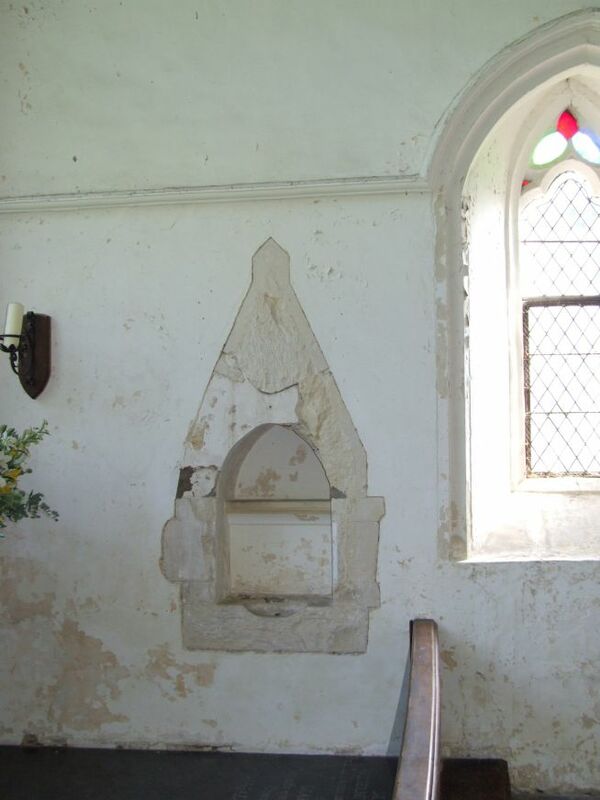 The beautiful old tortoise stove beside the font has gone, as has the scuttle full of coal that stood beside it. They were a beautiful, organic link with the people who worshipped here in the 19th century. Surely they could have kept them, even if they didn't use them anymore? West of the font is a quite extraordinary chest, presumably 13th century or so. It is fully three metres long, but only about fifty centimetres wide. 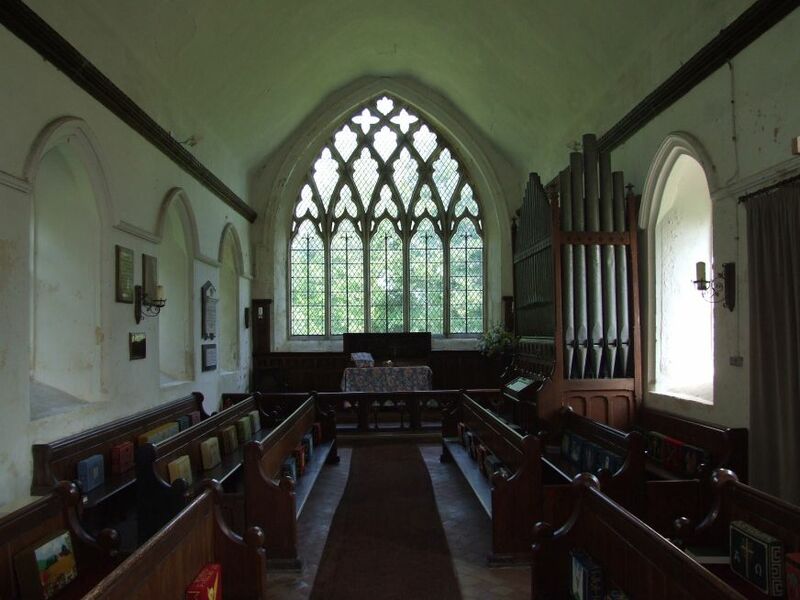 Turning to the east, it seems unlikely that the crocketted beam in front of the chancel arch was the rood beam - it is just too high. And in any case, there is a similar one to the west. It probably formed some sort of support to the rood; you can see a filled in tenon from the west that must have fixed to something. A hook above may have been for the Lenten veil, but again, I'm not wholly convinced. 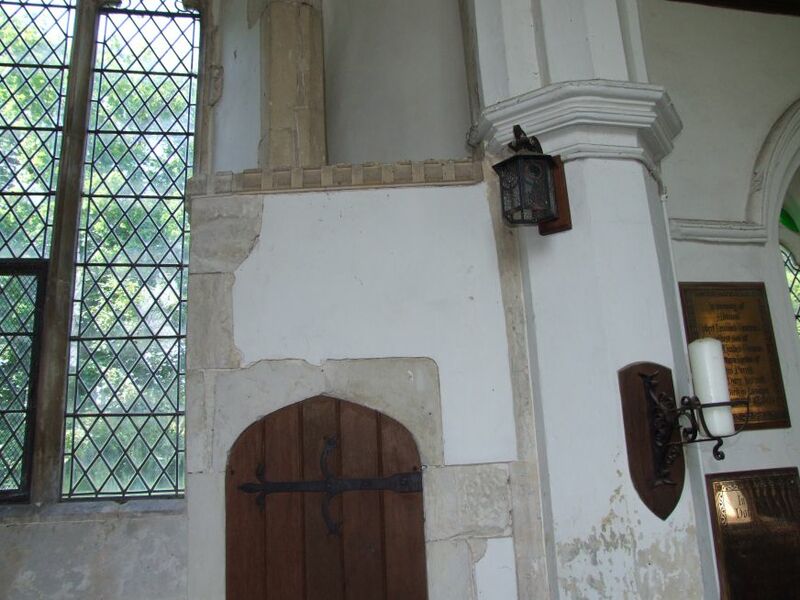 I can always think of all sorts of reasons why a hook might have been fixed in the apex of the chancel arch, can't you? There is a pretty image niche in one of the south nave window embrasures, and up in the sanctuary there are the remains of what must have been a simply enormous piscina. But all the relief has been hacked off. Robert Hinds Groome, the Rector here for 44 years in the late 19th century, was the best friend of the poet Edward Fitzgerald, of Boulge, and wrote a memoir of him. He doesn't seem to have shared Fitzgerald's sexual orientation - or, if he did, he worked very hard to overcome it, because memorials to his children line the chancel walls. Hinds Groome's own memorial is a pretty little reredos, showing the last supper. Mortlock recalls a fearsome dispute here two hundred and fifty years earlier, in the 1630s. This was the time that Archbishop Laud was engaged in his ill-fated attempt to restore the sacramentalism of Communion, by returning it to an altar in the chancel. 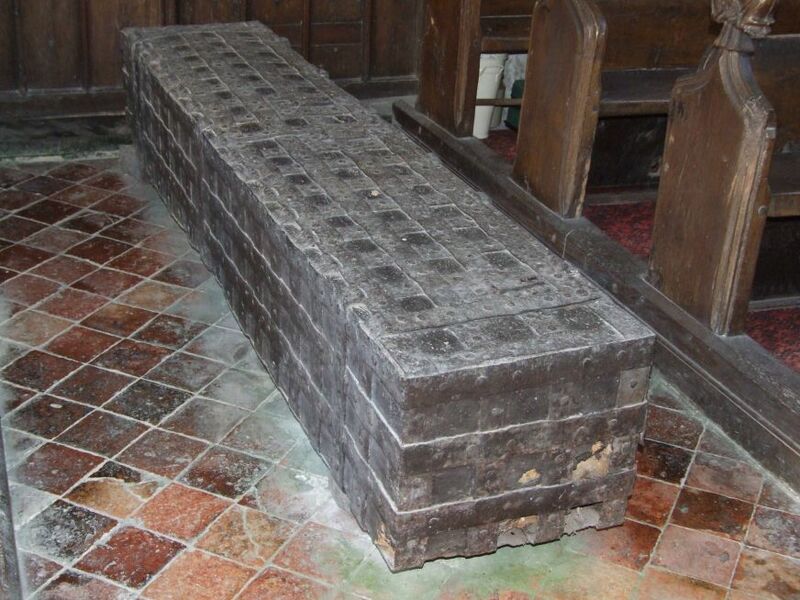 Members of the puritan Wheymond family violently objected, and blocked the Vicar from approaching the Communion rails. The whole thing seems to have degenerated into a bit of a riot. Hard to imagine, in this silent place. 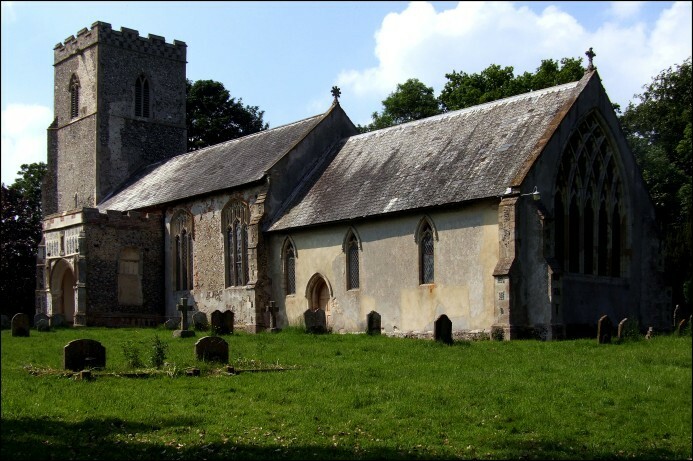 When I first came to Monk Soham, I remarked that, although the church had no guidebook, it did have a pile of photocopies of Monk Soham's entry in Arthur Mee's King's England. Now, this had been published some sixty years previously; but it didn't seem very old in a place like this, and it certainly wasn't out of date.But it wasn't credited, even though it was still in copyright. I said at the time that this was a little naughty, and imagined the ghost of barmy Arthur rising from his grave to hunt the copier down, to wreak revenge on plagiarisers everywhere. Coming back in 2007, I found that the church now has an excellent guidebook, and Mr Mee has been banished back to whence he came. Another addition since my last visit is the large, neo-classical memorial to Ronald Creasy at the church gate. Creasy was a prominent Suffolk Fascist. It seems a world ago now, and extraordinary that a memory of it should have survived into the 21st century, but in the 1930s, the Fascist movement was strong in the Norfolk and Suffolk borderlands, particularly among non-conformist farmers, who recruited the British Union of Fascists in their campaign against the Church of England's demands for tithes. Famously, there were pitched battles between the police and uniformed BUF members outside Wortham rectory, which the fascists were picketing. 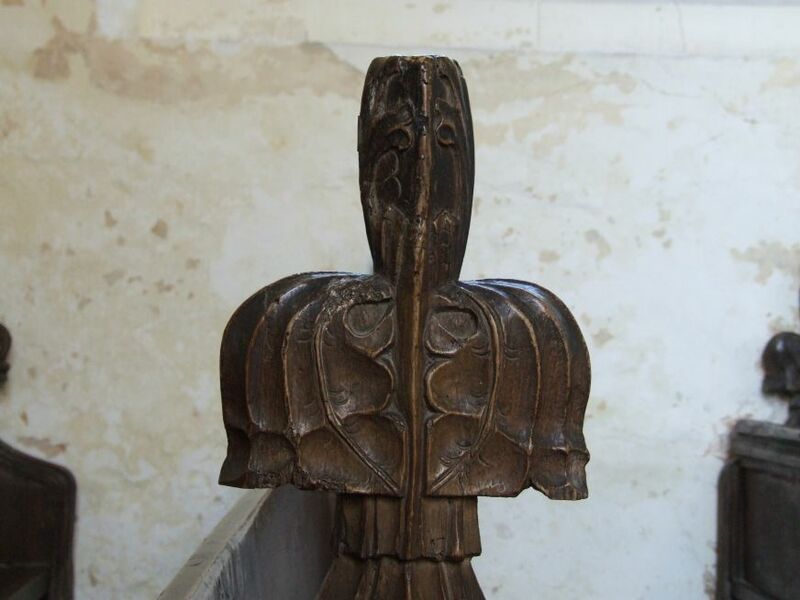 Two prominent Suffolk and Norfolk writers, Doreen Wallace (author of The Tithe War and East Anglia), and Henry Williamson (author of Tarka the Otter), were Fascist sympathisers, and ensured a sympathetic hearing locally. The Fascist movement was never huge in Britain, reaching a peak of about thirty thousand members at a time when the Communist Party had more than half a million. By 1939, the wearing of uniforms by Fascist groups in Britain was illegal, and the British Union of Fascists had truncated its name to the British Union. Ronald Creasy, a farmer in Monk Soham, was a BU member, councillor, district leader, and selected as the British Union candidate for the Eye constituency. But World War II intervened. Any sympathies the Fascists may have received rapidly diminished as the horror of total war was unleashed in Europe. Like many Fascists, Creasy was a pantheist. Paganism was an important element within early 20th century Fascism throughout Europe. Creasy saw God in all things, especially in the cycle of the seasons, the crops, wild nature and the turning of the year. In later life, he occupied himself with writing letters to newspapers, and was often the first person in Suffolk each year to hear the cuckoo.